West Point, Virginia is a quiet Southern town, with some stunning 19th and early 20th Century architecture in the historic downtown district. 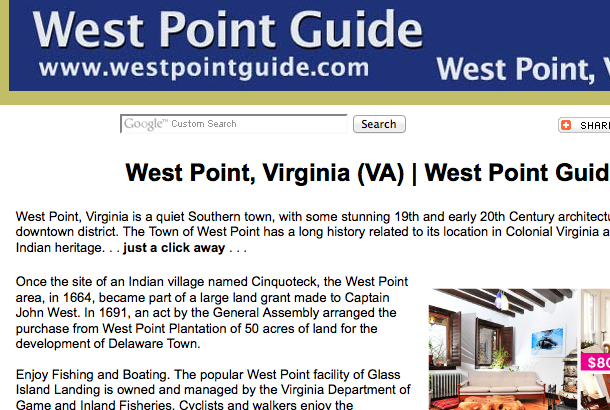 The Town of West Point has a long history related to its location in Colonial Virginia and its American Indian heritage. Once the site of an Indian village named Cinquoteck, the West Point area, in 1664, became part of a large land grant made to Captain John West. In 1691, an act by the General Assembly arranged the purchase from West Point Plantation of 50 acres of land for the development of Delaware Town. Enjoy Fishing and Boating. The popular West Point facility of Glass Island Landing is owned and managed by the Virginia Department of Game and Inland Fisheries. Cyclists and walkers enjoy the Riverwalk Trail. Stop at Town Hall at 329 Sixth Street for a copy of the West Point Historic Walking Tour Map or call ahead for a copy to be mailed to you. 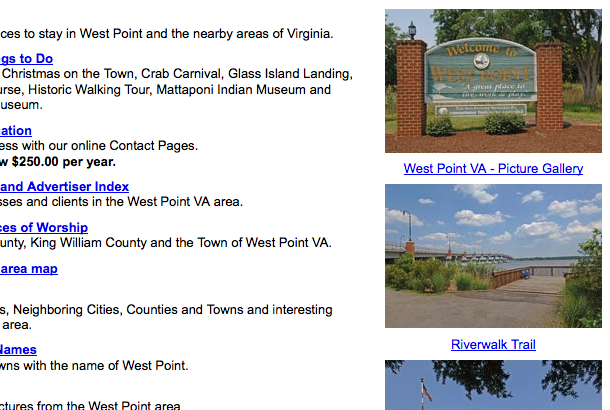 The annual Crab Carnival is usually held the first weekend in October, is famous throughout Virginia. West Point, Virginia is located in King William County, 37 miles east of Richmond, Virginia (center to center) and 63 miles northwest of Virginia Beach, Virginia. West Point is situated where the Mattaponi and Pamunky Rivers join the York River. 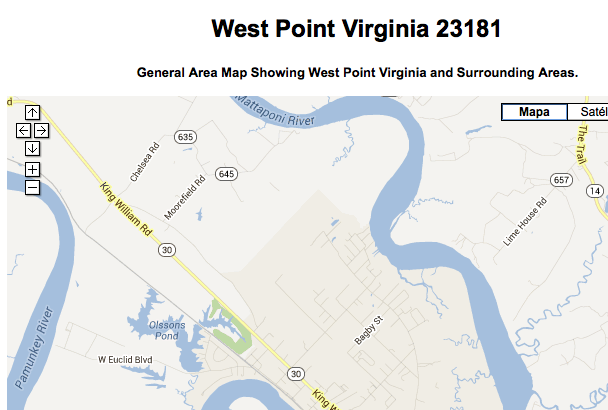 West Point is located at 37°32′ 37″N, 76°48′ 19″W (37.543733, -76.805366).